As if you didn’t know, it’s ROASTING here in the UK at the moment. This week we’re due to see temperatures as high as 34/35 degrees! While other, hotter, countries sit back and laugh, not realising our homes and workplaces are built to stay warm rather than cool, we’ve been busy thinking up ways to keep the heat at bay. 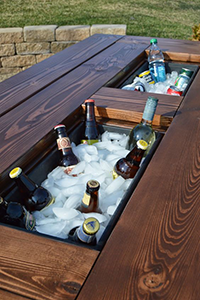 Now you’d be forgiven for not thinking of pallets when you’re trying to come up with ways to keep cool, but as you’ll know by now, we have pallets-on-the-brain! 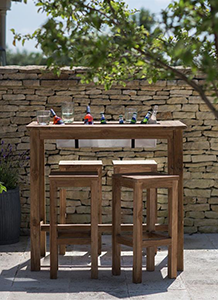 So in this blog we’d like to show you the inventive ways that our good old pall, the humble wooden pallet, can be used to help you stay cool. 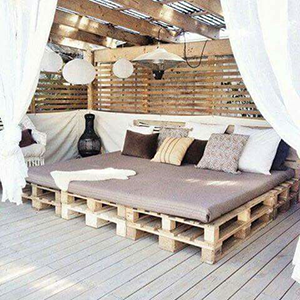 Pallets are actually ideal as sun and heat shelters in the garden. They’re economical, light and full of ventilating gaps for the breeze to whip through. They provide shade without creating a stuffy atmosphere. 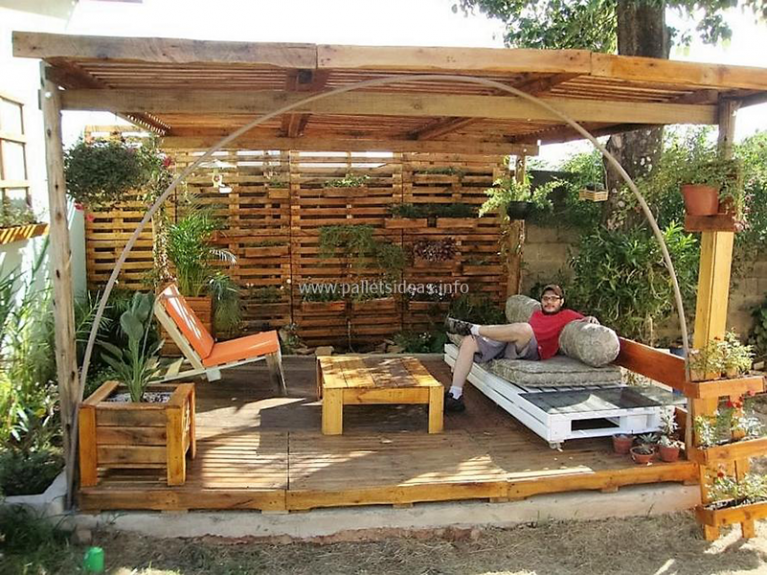 These pallet pergola is just perfect. And to make it you’ll need a little wood-working know-how, some gorgeous fabric to create curtains and your favourite outdoor cushions. Optional daybed made from pallets! Here’s a selection of our favourites to inspire you. Bonus Tip: Paint your pallets white to deflect the heat! Bonus Tip: Let creeping plants grow up around your pallet pergola for extra shade. 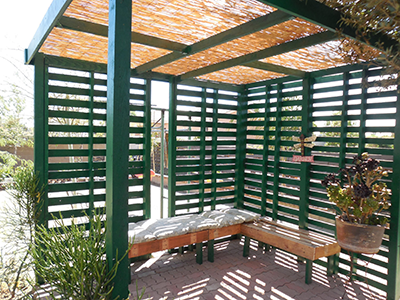 Bonus Tip: Adding sheets of MDF in the spring, autumn or winter can turn your pergola into a sheltered spot to read, entertain or dine. 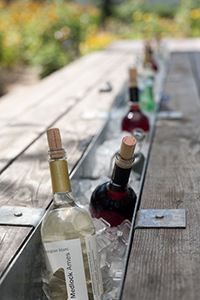 This is a great way to cool down and re-use any plastic bottles you might have lying around. We don’t have a photo of this one, so instead we’ll have to describe it to you. Take a pallet plus some extra loose boards. Board up the underside of the pallet to match the top side. Fill empty plastic bottles with water and leave them in the freezer overnight. Hot weather indoors is forcing more of us into the garden, especially when you first get home from work and realise your home has been sat in the sun warming up like the world’s most efficient greenhouse! 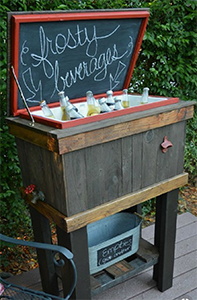 But it’s still hot outside and you deserve a lovely cold beer/wine/soft drink, so instead of running in and out to the fridge all evening, you need a mobile fridge outside. That’s where the pallet drinks cooler comes in! 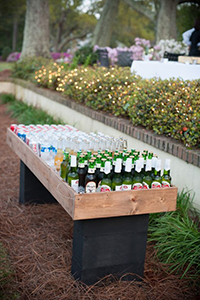 There are many variations of this ingenious idea, you could incorporate your pallet drinks cooler into a pallet table, or a pallet bar, or you can simply make a pallet box to store your ice and drinks in! 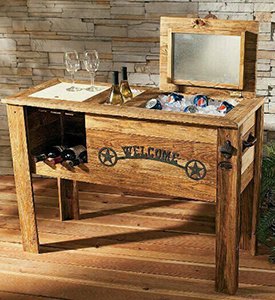 All you really need is pallet wood and a lot of ice, there’s a lot of room to play with this idea! And if you’d really like to show off at an up-coming BBQ party, why not try your hand at this one? 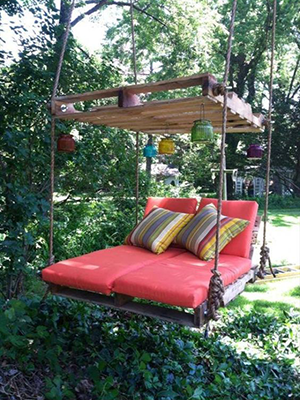 To make your pallet swing chair you’ll need a few good strong pallets, the bigger the better, and to add outdoor sun lounger cushions to provide the ideal level of comfort! 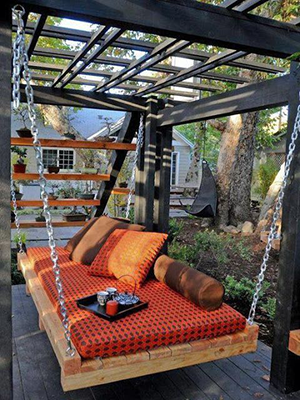 Hey, you could even incorporate a pallet chair swing into your pallet pergola, go nuts! 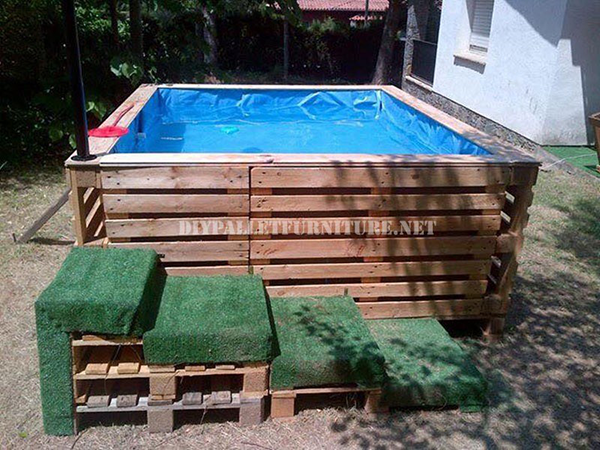 Last but certainly not least, the pallet pool! The pool is the ideal place to relax in this Californian style weather, but 99.9% (just guessing) of people in the UK don’t have their own pool, unsurprisingly! So if you’ve been seeking refuge in the kids paddling pool, feeling like a giant and not nearly as refreshed as you wish to be, maybe it’s time for a pallet pool! As with all pallet projects, please please be sure to use a safe pallet! Discarded pallets are just that; discarded. You have no idea why, they may have had dangerous chemicals spilled on them and been dumped. 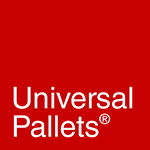 The only safe pallet is the pallet that you know the full history of, and Universal Pallets can help you with that. Shop for your pallets online now or get in touch to discuss your next pallet project with us.